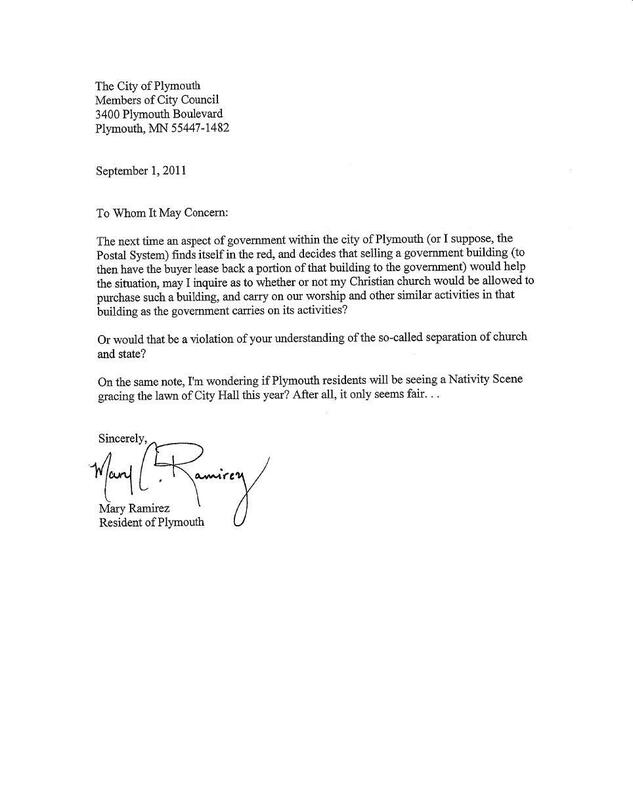 As I sat pondering my two previous posts regarding the recent, rather hypocritical actions of the Plymouth City Council, I wondered what kind of response I might get if I flat-out asked them if they would have given the same permission to a Christian Church. -In that case I’d let them know that they need to contact the Star Tribune for a restatement, because according to that publication, it’s a mosque. Which, last time I checked, is a house of worship. -Incidentally, I’m not sure I fully understand how going from paying nothing to occupy the building, to now paying rent for the same building, is helping the economic straits of the Postal System. Hmm. Moving on, I might point out that regardless of the specifics of the agreement, the government is STILL continuing operations in a house of worship. That’s just a fact. I do not suffer from Islamaphobia. I’m not a racist, a bigot, or any other choice word typically chosen to address individuals of my particular leanings. I’m simply pointing out that if certain religions (and almost exclusively Christianity) must be subject to the government’s own (flawed, as we discussed in the last post) view of the “separation of church and state,” why does this mosque get a pass?